Maternal DHA deficiency restricts migration of cortical neurones in rat feral brain. Staining specifically reveals migrating cells as they from the cortex. Data from Yavin, Himovichi & Eilam (2009), Neuroscience. The peak vulnerability to harm from nutritional deficiencies occurs during pregnancy, when the central nervous system is first developing. 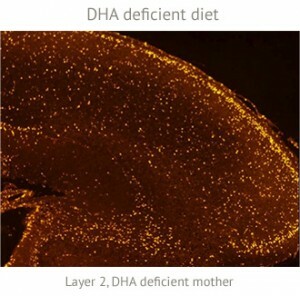 The quality of the maternal diet is particularly dependent on the intake of micronutrients such as vitamins A and B (including riboflavin/B2); choline, and folate; trace elements such as iodine, iron, zinc, copper; and omega-3 and 6 highly unsaturated fatty acids – in particular, DHA and arachidonic acid (AA) for brain development. Disruptions in regulatory processes, such as the sleep-wake cycle . Poorer performance in global measurements of cognition, motor skills, and social-emotional behavior [44, 45]. Mental retardation and cognitive deficits associated with reductions in learning capacity and productivity . Delayed neuronal migration (which is the process in which neurons travel from their place of origin to their final position in the brain so a delay means that the neurons are not arriving to their predetermined position in the developing brain). It is thought that disrupted neuronal migration during development may lead to cognitive, motor, and intellectual disabilities. Disrupted dendritic arborisation which essentially means that the forming of the dendrites of nerve cells into branching / a treelike pattern is disrupted which in turn is thought to impact cell signalling. Abnormal neuronal development in the hippocampus ; a brain region implicated in memory and learning. Alterations of several neurotransmission systems, including the dopaminergic and serotonergic systems [47-49] which regulate mood and other critical functions. In a number of studies, restoring omega-3 fats into the diet during lactation has reinstated the brain fatty acid composition and some parameters of neurotransmitter function . 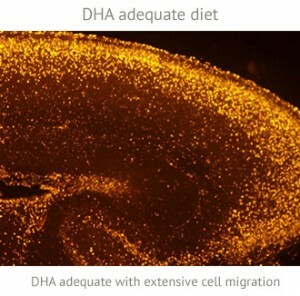 Although, these studies are challenging if not impossible to ethically replicate in humans, they arguably demonstrate the essentiality of omega-3 fats for healthy brain development and function.